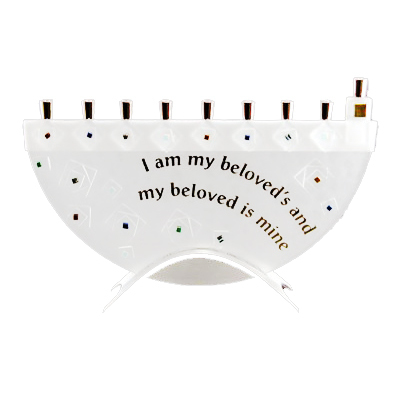 Handcrafted By Sara Beames, This Fused Glass Menorah Has The Words "I Am My Beloved's And My Beloved Is Mine" In Gold Type. A Geometric Pattern Of Clear Textured Glass With Dichroic Glass Highlights. The Menorah Is 8" Tall X 11 3/4" Wide With Pewter Candleholders And Base. We Have Many Of Sara Beames Designs In Stock. At Times This Specific Item May Be Out Of Stock, Which Is Not Indicated On Our Website. When Out Of Stock, Delivery Can Take 2 Weeks. Please Contact Us If You Need This For A Specific Date. The Artist May Be Able To Accommodate A Rush Order.